Researchers are hoping to further unlock the mysteries of planet and star formation and study many more young stars and solar systems by using the Atacama Large Millimeter/submillimeter Array (ALMA), and the newly-expanded Karl G. Jansky Very Large Array (VLA). Two new and powerful research tools are helping astronomers gain key insights needed to transform our understanding of important processes across the breadth of astrophysics. The Atacama Large Millimeter/submillimeter Array (ALMA), and the newly-expanded Karl G. Jansky Very Large Array (VLA) offer scientists vastly improved and unprecedented capabilities for frontier research. The cutting-edge research enabled by these powerful telescope systems extends from unlocking the mysteries of star- and planet-formation processes in the Milky Way and nearby galaxies, to probing the emergence of the first stars and galaxies at the Universe’s “cosmic dawn,” and along the way helping scientists figure out where Earth’s water came from. A trio of scientists outlined recent accomplishments of ALMA and the Jansky VLA, both of which are in the “early science” phase of their development, as construction progresses toward their completion. The astronomers spoke to the American Association for the Advancement of Science annual meeting in Vancouver, British Columbia. One exciting area where the two facilities are expected to unlock longstanding mysteries is the study of how new stars and planets form, in our own Milky Way Galaxy and in its nearby neighbors. “These new ‘eyes’ will allow us to study, at unprecedented scales, the motion of gas and dust in the disks surrounding young stars, and put our theories of planet formation to the test,” said David Wilner of the Harvard-Smithsonian Center for Astrophysics (CfA). In addition, he added, the new telescopes will help show the first stages of planet formation — the growth of dust grains and pebbles in the disks — as well as show the gravitational interactions between the disks and new planets embedded within them. “The power of ALMA and the expanded VLA also will allow us to study many more young stars and solar systems — probably thousands — than we could before. This will help us understand the processes that produce the huge diversity we already see in extrasolar planetary systems,” Wilner said. One set of early ALMA observations, of a disk around a young star nearly 170 light-years from Earth, promises to shed light on a much closer question — the origin of Earth’s oceans. Scientists think much of our planet’s water came from comets bombarding the young Earth, but aren’t sure just how much. The key clue has been the fact that our seawater contains a higher percentage of Deuterium, a heavy isotope of Hydrogen, than is found in the gas between stars in our Galaxy. 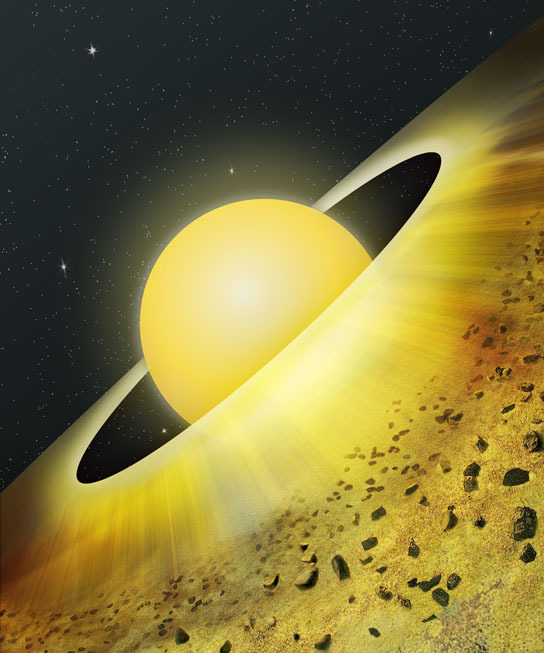 That enrichment of Deuterium is thought to be caused by low-temperature chemical reactions in the cold outer regions of the disk surrounding the young sun — the region from which comets arise. The new ALMA observations, however, show that, in a disk surrounding the young star TW Hydrae, Deuterium also is found in the warmer region closer to the star. “With further studies like this, we are on the path to more precisely measuring the percentage of Earth’s ocean water that might have come from comets,” Wilner said. Wilner worked with Karin Oberg and Chunhua Qi, also of CfA, and Michiel Hogerhejde of Leiden Observatory in the Netherlands, on this research. Looking beyond the Milky Way, Christine Wilson, from McMaster University, points out that ALMA and the expanded VLA will give astronomers the ability to carefully study star formation in widely-different types of galaxies, from the very faint to the extremely luminous and active ones. “This will help us understand what regulates the rate at which stars form in galaxies,” Wilson said. One result from the VLA, however, seems to add to the mystery about this. John Cannon, of Mcalester College, and his colleagues studied a very small star-forming galaxy and found that its mass is largely dark matter, rather than the gas usually thought of as the fuel for star formation. “Their sample of small, but star-forming, galaxies has low amounts of gas, and this is puzzling,” Wilson explained. The two new telescopes also will help extend the study of galaxy evolution and star formation back to the Universe’s youth, 10 or 12 billion years ago. “The Jansky VLA and ALMA are ideally suited to reveal important new facts about very distant galaxies, which we see as they were when the Universe was a fraction of its current age,” said Kartik Sheth, of the National Radio Astronomy Observatory. “The new capabilities of these two facilities will show us the details of dust and gas in galaxies of this early epoch, thus helping us learn how such galaxies evolved into the types we see in the current Universe,” he added. Already, Sheth said, both instruments have provided tantalizing glimpses of both atomic and molecular gas in galaxies as distant as 12 billion light-years. “The huge range of ages in galaxies that we will be able to observe with these facilities represents a big step in piecing together the full history of how galaxies formed, evolved, and made stars, over the vast span of cosmic time,” Sheth explained. “The early research results from ALMA and the Jansky VLA show the tremendous potential of these facilities for studies of galaxies and their history. However, this is just one area of research in which these telescopes will make landmark contributions to our understanding of astronomical processes. ALMA and the Jansky VLA are leading tools for answering the most important questions of 21st-Century astrophysics,” said National Radio Astronomy Observatory Director Fred K.Y. Lo. ALMA, an international astronomy facility, is a partnership of Europe, North America and East Asia in cooperation with the Republic of Chile. It is located at 5000 meters’ elevation in the northern Andes. Located on the San Agustin Plains of central New Mexico, the Jansky VLA is a North American partnership, with the U.S. National Radio Astronomy Observatory and the National Science Foundation as the lead partner, and additional key contributions provided by the National Research Council in Canada, and the Consejo Nacional de Ciencia Tecnologia in Mexico. Be the first to comment on "Using ALMA and VLA to Unveil Astronomical Mysteries"